MacGregor, part of Cargotec, has won a contract to deliver a 250-tonne SWL active heave-compensated (AHC) subsea crane for the 120m construction vessel, Island Intervention. The crane was ordered by Marine Procurement Ltd, part of the US company Edison Chouest Offshore. An existing vessel operated by the US/Norwegian partnership between Edison Chouest Offshore and Island Offshore requires greater lifting capability; a MacGregor 250-tonne SWL AHC subsea crane fulfils the upgrade requirements. 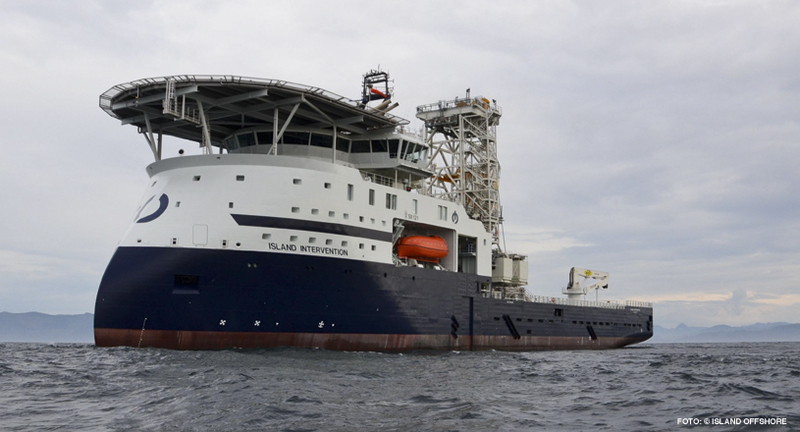 Island Intervention is currently operating in the North Sea for the US/Norwegian partnership between Edison Chouest Offshore and Island Offshore. The vessel works in the offshore construction market and was delivered by Norwegian yard Ulstein Verft in 2011; its current lifting capacity is 140 tonnes. "The vessel simply needs a bigger crane for the jobs that it undertakes," says Frode Grøvan, Director, Sales and Marketing for Advanced Load Handling. "The order confirms the trend that we see of subsea modules getting larger and heavier, therefore requiring operators to equip their vessels with ever more capable cranes. "At MacGregor, we have the expertise necessary to ensure that retrofit projects like this run smoothly and successfully, with downtime kept to a minimum."